I discovered recently that all signage left on the footway must leave at least 1 meter clear at the side, preferably 1.5 meters; the actual wording is “in no circumstances must the width of the footway be reduced to less than 1m, preferably not less than 1.5m” (Traffic Signs Manual chapter 8 clause D4.4.1). 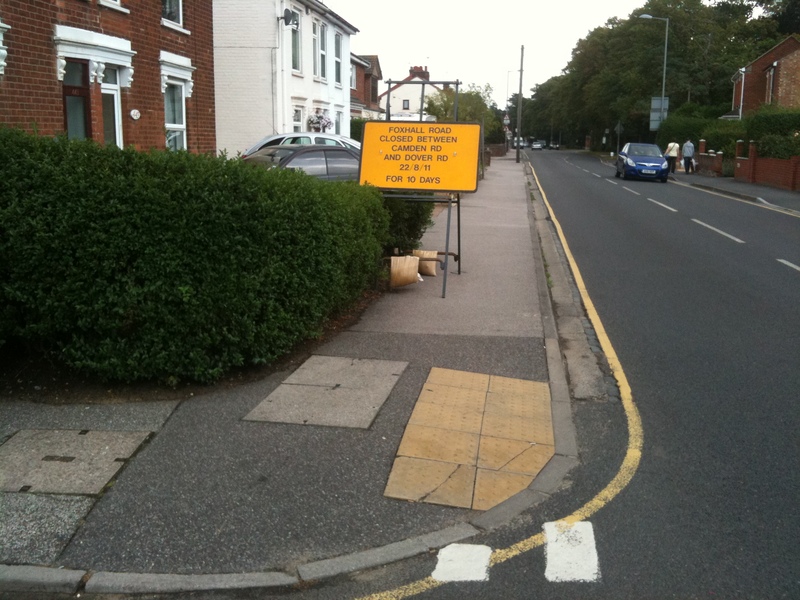 The sign in the picture below leaves a minimal 600mm beside a very busy and dangerous road. On a positive note, I found the Palmer Group, who put the signs there, very helpful when I phoned them and they said they would sort is ‘asap’. Given the narrow pavement and the big sign I will be interested to see what they do! Update: They moved the sign to a very suitable place within 12 hours. Great work and thanks… but next time please don’t wait to be asked! I have also just produced a causality map for the area in question showing where people have been killed and injured by cars in the area over the past 25 years. 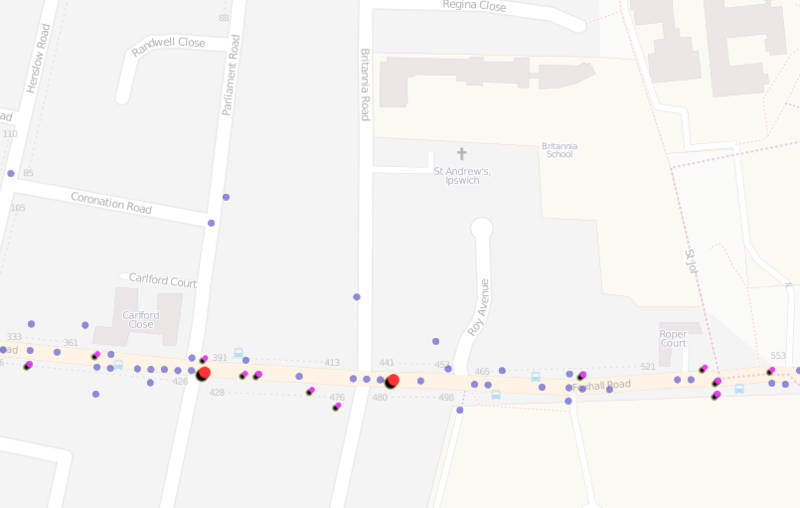 Two people have been killed in that time (the two red dots), 12 people have been seriously injured (the 12 purple dots) and there have been many slight injuries reported to the police (blue dots). ← It’s my spot and I’ll park what I want to! "In contrast to the changes made to every town and city to ease motor transport, walking has been made ever more unpleasant. Pedestrians have been treated with contempt. In a myriad of ways when we walk we are treated with less respect than when we drive". (quote for a cross-party parliamentary select committee report on walking in towns from 2001). This blog documents how this discrimination works, what laws underpin it and what people are doing to counter it. Please take action and share your experiences in the comments section, on twitter or join our facebook group. Add photos to the Flickr pool. All photographs cc-by-sa 3.0 unless otherwise stated or obvious from the source. Tell your story to the world! ‘Strengthing’ maximum parking standards by weakening them?? Are vehicles allowed to park on the pavement?